Perhaps these grow in your area and you can help me positively ID them please. 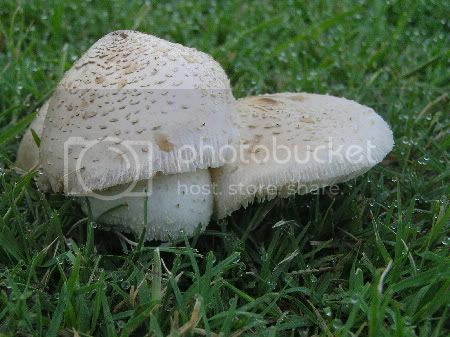 Found these recently in my lawn (following summer rain) and I believe they might be Chlorophyllum hortense, but not sure. Can't find much on the net. Not interested in consuming. Cap: Cream (and shaped like "drumstick" when new) with a yellow/brown apex - matures (more white) to round shape like in the pic and then flattens out often with knobbly bit on top (and often a dirty colour rather than white - peels readily (young) - dry - scales (white to light brown) - some have split several times around the edge as they mature. Stalk: Whitish but a bit brownish near base - hollow - smooth - does not easily remove from cap - stains red immediately on cutting. Flesh: White, thick - stains pinkish/red upon cutting. Gills: White/cream young and mature. Habitat: In lawn following rain - fairy ring of nearly 50 specimens emerging over a period of 4 days. Are the ones in the top photo the same species as the ones in the bottom two? They look different to me. I have a day 4 pic if anyone is interested. When you state that the spores are white, did you do a spore print on white paper to verify that? The habitat is odd for the species I'm familiar with here, unless you were to come up with a greenish spore print. They look most like Chlorophyllum rachodes to me, but the habitat is wrong. That species doesn't like grassy areas and is almost always found growing under pines. Since you're in Australia it's very possible that you have a species we don't have here in North America. Yes, I did a spore print on white paper and one on black paper. At first I thought it was macrolepiola konradi but that one didn't mention the red staining, then I was steered onto macrolepiola rhachodes for the red staining but the spores were the wrong colour. Then I was steered onto the chlorophyllum hortense which has both white spores and red staining. Hoping that someone has some knowledge in this area and can confirm or deny my ID. Thanks for the input so far...much appreciated. They look kinda like Handkea subcretacea to me. Roll em 7 and 11's. But picture #3 is not in a circular shape. So it's hard for me. 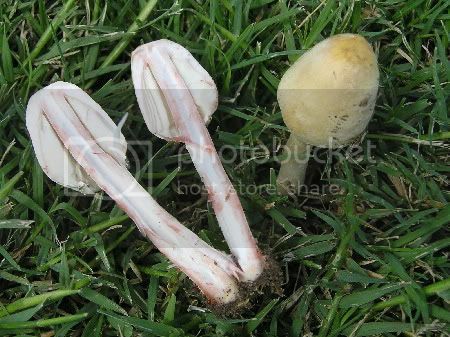 The spores of Chlorophyllum rachodes (=Lepiota rachodes and Macrolepiota rachodes) are white. The habitat is the thing that doesn't match that species. 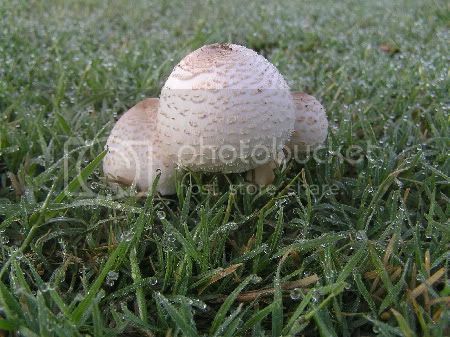 Whenever I find a lookalike in grass here it always turns out to be Chlorophyllum molybdites. 1,504 topic views. 7 members, 20 guests and 5 web crawlers are browsing this forum.